Last week was E3. There was a lot of video game news that came out of the show. Games were announced, systems were announced, demos shown, and new trailers released. 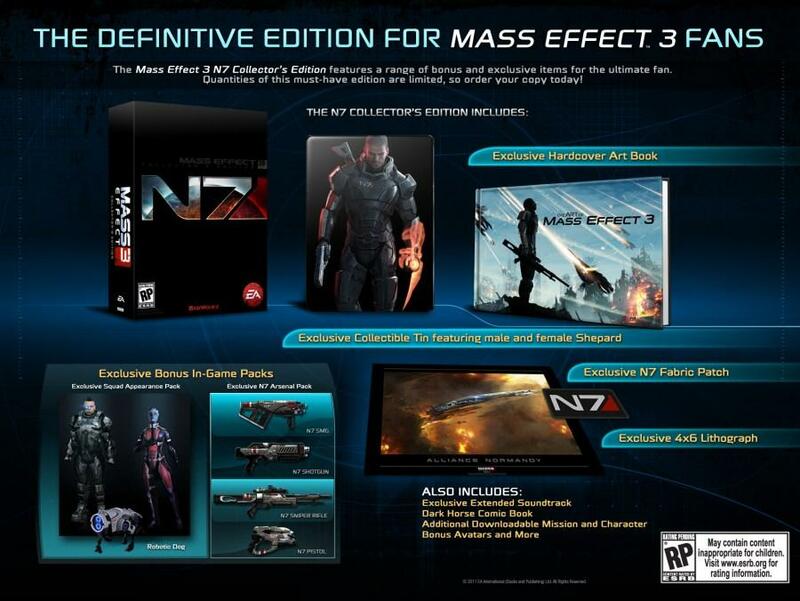 We also got information on Mass Effect 3’s Collectors Edition. Sure, we knew that there would be a Collector’s Edition but we didn’t know what it would contain. Those details have emerged and now we know what to look forward to in March 2012. A metal case. Just like the ME2 game, the actual discs will be contained in a “collectible tin.” This one will feature the male Shepard on the front and the female version on the back. Having never played as either of the default appearances I much prefer the N7 design on the outer case to the images on the tin. An exclusive hardcover art book. I like this one, a 70 page art book from the production team. I’m a big fan of the production art. The book will probably contain some spoiler material so if you’re sensitive to that kind of thing you probably will want to leave it alone until you’ve completed the game. N7 fabric patch. Not sure if I’d ever use it, but I think it is a neat extra. Exclusive 4x6 Lithograph. It looks like a very cool picture of the Normandy, but seriously, it is the size of a post card. Not really something to get excited over. A unique Dark Horse comic. I’m not sure what they mean by unique. Honestly the Mass Effect comics haven’t thrilled me. I’ll read this one, I just don’t have high hopes. Social badges, avatars, and perks. This is all for Bioware’s social website. If you spend a lot of time on that website, these might appeal to you. Exclusive Extended Soundtrack. You either like video game soundtracks or you don’t. Personally I’m hoping to some day use these as the backdrop to a pen and paper Mass Effect RPG. Normandy Xbox 360 Avatar item. I’m ashamed to say, this excites me. Obviously this is for the Xbox 360 version only. That’s all the items that don’t even affect your game. Some good things and some okay things. Next we’re going to look at all the in game items. N7 Arsenal Pack. Consists of the N7 Sniper Rifle, SMG, Shotgun, and Pistol. I have no idea how good they are, but more weapon choices are always a good thing. N7 Hoodie. Something for Shepard to wear on the Normandy. I’ll have to see this one before I pass judgment; Mass Effect’s in game version of casual wear can be pretty strange sometimes. Alternate Appearance Pack. New outfits for Ashley, Kaidan, James Vega, and Liara T’Soni. I’m a sucker, I bought both of the appearance packs for ME2 so I’m glad to see this one included in the CE. Robotic Dog. A FENRIS mech that follows Shepard around the Normandy. This is very important. If they can do this with the robot dog, they can give us a Varren. I was so sad that I had to leave Urz on Tuchanka. An additional Mission and Character? This is a strange one. It was listed on the images and still listed on some websites but it is being pulled from others. My personal guess is that if we are getting this, it will be something all pre-orders will get. 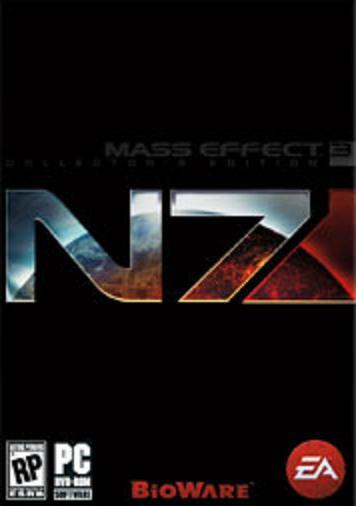 The last thing I wanted to mention about the different versions of Mass Effect 3 coming out is that there will only be two versions. Months ago it was hinted that there would be a version with some kind of uber-expensive pack-in, but we’re being told that this is no longer happening. So unless something changes in the months to come you only have the Standards and Collector’s Editions to choose from. Wish We could get the tins printed with our custom Shepards.